First developed by Michel Foucault more than thirty years ago, "governmentality" has become an essential set of tools for many researchers in the social and political sciences today. What is "governmentality"? How does this perspective challenge the way we understand political power and its contestation? This new introduction offers advanced undergraduate and graduate students both a highly accessible guide and an original contribution to debates about power and governmentality. To offer researchers some methodological suggestions for undertaking studies in governmentality, stressing that its critical edge becomes blunted if it is detached from historical/genealogical modes of inquiry. 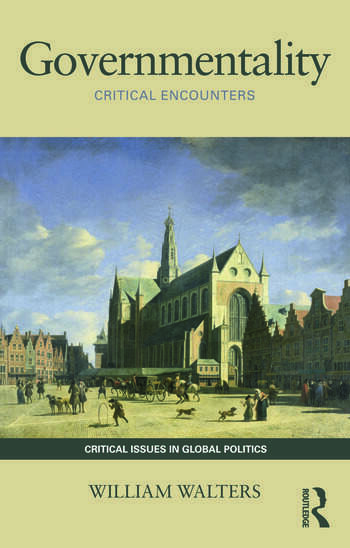 This book offers a set of conceptual and methodological observations intended to keep research in governmentality a living, critical thought project. Above all, it argues that the challenge of understanding the world calls for the addition of new thinking equipment to the governmentality toolbox. Governmentality: Critical Encounters will prove useful for students of social and political theory, international relations, political sociology, anthropology and geography. William Walters is Professor of Political Science and Sociology at Carleton University, Ottawa Canada.